Synergy Room Web Conference features a shared whiteboard for the interactive display and annotation of web pages, PowerPoint slides, application windows, or any other background image. One of the most useful features of the Synergy Room Whiteboard is One-Click Web Page Annotation. Beginning with a web page loaded in the embedded web browser, click on the whiteboard button on the embedded browser's toolbar. A snapshot of the current web page is uploaded as the new whiteboard canvas. 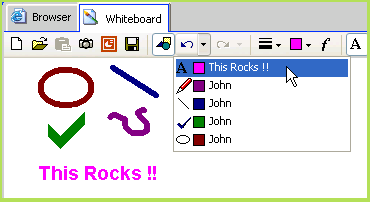 Now any of the whiteboard drawing tools may be used to mark up the page in real time. Below, the highlighter tool has been used to highlight first search result. Another way to load a canvas onto the whiteboard is using the Open Background toolbar button, or by pressing Ctrl+O. Standard image file types such as JPG, PNG and GIF are supported. A third way to load a background canvas is by pasting an image from the system clipboard using the Paste toolbar button, or by pressing Ctrl+V. The Window Snapshot tool allows a presenter to capture the image of any window on the desktop using a window finder tool. After clicking on the camera icon, Synergy Room disappears to give easy access to other windows on the desktop, and the finder tool appears. Drag the "sight" from the finder window and drop it over top of any other window. The selected window is captured and uploaded as the new whiteboard canvas. Use of the One-Step PowerPoint tool is discussed here. The Toggle Annotations feature allows a quick "before and after" view of the slide by hiding and showing annotations. When annotations are toggled off, everyone's drawing tools are disabled. This is an easy way for a moderator to lock down the whiteboard against changes. The selective undo feature of the Synergy Room Whiteboard allows a presenter to undo or redo specific actions based on color, drawing tool, author, or text content. For added convenience, text is movable and editable by double clicking the text item directly on the whiteboard. Thickness: Line thickness, size of checkmark, laser pointer. Color: Drawing color, laser color. Font: Text font and color. Text Tool: Drag a rectangle in which to edit text. Highlighter Tool: Works on solid (not textured) backgrounds. Checkmark Tool: Place a checkmark at the cursor position. Line Tool: Holding the Alt key makes the line horizontal. Shape Tool: Draw the selected solid or filled shapes. Laser Pointer: Only one person's laser is active at a time. 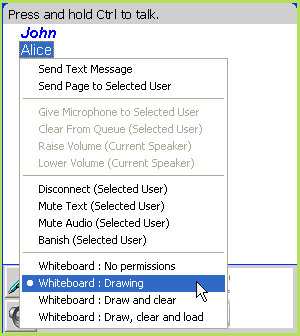 Whiteboard drawing permissions are configured globally in the room's control panel, and individually from within Synergy Room. By default, moderators have full permissions, and non-moderators have a read-only view of the whiteboard. When in read-only mode, the whiteboard toolbar is hidden, and only the canvas is visible. Open: Ctrl+O - open image file as background. Save: Ctrl+S - save whiteboard image to disk. Copy: Ctrl+C - copy whiteboard image to clipboard. Paste: Ctrl+V - paste the clipboard image as background. Whiteboard keyboard shortcuts require that the whiteboard has the input focus, as indicated by a dotted border on the right and bottom edges of the whiteboard image. Simply click on the whiteboard image to give it the input focus.